After the death of her husband 17 years ago, her in-law took everything that belongs to her husband and left her with nothing. Mrs Ernestina Okwuchukwu popularly known as madam burgess in this series narrates her experiences and how she became a millionaire from building a business from nothing. Lagos, Nigeria— on a sunny day, a large auto part market along Ebuta Metta East, Oyingbo is bustling with activities—auto parts dealers and potential buyers negotiating the prices of different products in hushed and pitched voices. After a quick glance over the auto part market environs, I was greeted with curious glares of what-do-you-want-to-buy. But I’ve not come to buy spare parts. I have come to see Madam Burgess, an amazing millionaire who has earned a name and a beautiful living from selling auto parts and tyres—a business dominated by men in this part of Lagos. Her office is just two blocks away from where I alighted from and with strings in my steps I got there in no time. Mrs Ernestina Okwuchukwu, 42, is a business woman who deals in tyres of all brands. The short, tubby woman skinned in a slightly fair complexion is the CEO of Obidublin Burgess Nig. Limited. Until recently Madam Burgess sells auto parts of motorcycles and vehicles. Now, she sells all brands of tyres and engine parts grease in wholesale and retail prices. “Promise my first born was three years old, while his brother was a month, still very young,” Mrs Okwuchukwu said, narrating her experience to YNaija. After his death, his family took possession of his property: His house, his businesses, cars—everything, including money stacked in his bank accounts. Mrs Okwuchukwu was left with nothing. But this is barely the case in Nigeria where discrimination against widows by their in-laws upon the death of their husband is rife. When Mrs Okwuchukwu lost her husband in 2000, she was just 30. Few years after her husband’s demise, suitors were pouring in, requesting for her hand in marriage. Then in 2008 she decided to re-marry again but the way her fiancé maltreated her kids discouraged her. “Once he comes (to visit me), he will not allow the children to come closer to me. He shouts at them. So I said if I get married to this man, he will maltreat my kids this way,” she told YNaija. Then she decided she will not walk down the aisle with any man until her children graduate from the university. “Although it has not been easy staying single, many people, especially my family are not happy that I am still single 17 years after I lost my husband,” she told YNaija, adding that she did this for her children—so she would have more time with them. After the death of his husband, she started out as a messenger at Oyingbo spare part market—just to put food on table for her kids. She would convey customers’ goods with a wheelbarrow from the spare part market to the point where the spare parts would be convened with a vehicle. “At the end of the day, some will give me 200 naira, I will still come back the next day,” she said. She kept doing that until she met someone who introduced her to the sales of fairly used wheelbarrow tires—then she was fortunate enough to buy them on credit, sell and she made profit through that until 2006 when she started her own business. She started with five tires, five tyres turned into ten, ten turned into 50, today she has three big stores thronged with tyres fast forward to 2017. The rate of female entrepreneurship is higher in Africa than in any other region of the world, the World Bank says. Mrs Okwuchukwu is one of the 41% of women in Nigeria who are entrepreneurs compared to only about 10% in the U.S and 5.7 in the UK, according to the Gates and Clinton Foundations. 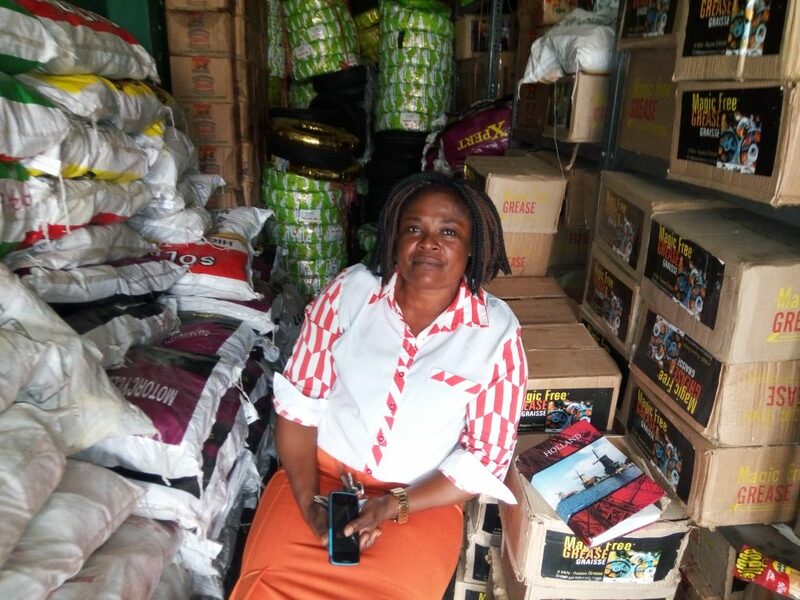 Seated in one of her shops in Onyigbo, Lagos, Mrs Okwuchukwu is the CEO of Obidublin Burgess, a company that deals in the sales of all brands of tyres with three big wholesales shops in Ebute-Metta market. From a scratch, she has built a business worth of millions, including a new house in Jakande, a estate that houses the rich in Nigeria’s commercial city, Lagos. “God is the one helping me, it’s not human being because if it is man I don’t think I will be here,” she said,” attributing her success to providence.